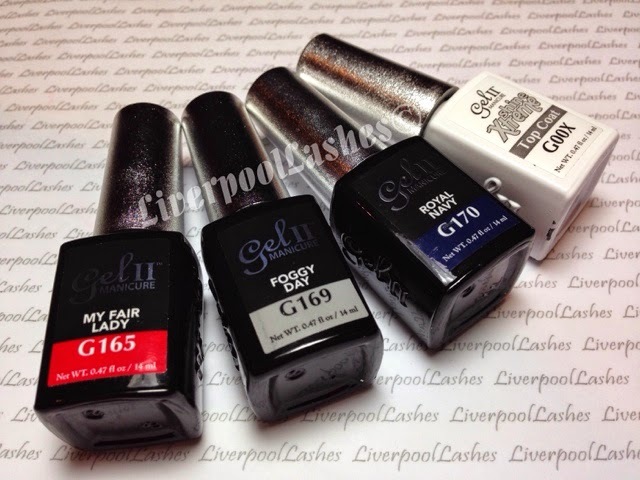 I was sent a set of Gel ll Foggy Collection to try for myself and give my first impressions of it prior to their UK launch at Olympia Beauty at stand B50 on the 21st September 2014. I have made a full video so if you'd prefer to watch that then it's here however if you're in work and probably really should be working then I will give you the lowdown for you to read too! First things first I'll start with the packaging, all of the bottles are black and opaque to stop the UV light getting to the formula. This is finished with a beautifully shiny lid which reminds me of the OPI Designer Series polishes. The names of each colour are on the front of the bottle along with some sort of colour code although I'm not sure why both is required! The whole unique selling point of this product is that it has no base coat so only two bottles are required. I think this idea is good as a time saved but CND Shellac is only 10 seconds in a UV lamp anyway. Gel ll is LED compatible which is fantastic for a faster curing time. I'm really excited about LED, I do love new technology! It's definitely impressive although to be honest I do use the two minutes to paint the other hand as I go so I'm not too sure on how much I would benefit from it. Gel ll will also cure in my UV Lamp, two minutes per coat. The instructions on the box say to use a 100/180 grit file to buff over the nail. Having being a CND Shellac user for three years now I must admit that this step gives me a little bit of a sweaty palm! I know I remove the shine for enhancements but Shellac is so kind to natural nails that thinning them in this way did make me worry a little. Luckily I spoke to the distributor and she said to ignore the manufacturers instructions and it still works. I have been advised by a fellow nail technician that if it doesn't adhere to certain clients nails then you do need to file over them. Sidenote: I was advised to stir the formula before use so I used an orange stick and clean inbetween each bottle! One of the first things I decided to do in the video was to test the consistency compared to Shellac. This was potentially a random test that I debated to leave in the video or not but I wanted to see if they were similar or one was thicker than the other and I'll tell you why I thought it was relevant. If you're a Shellac user then you will know that Cream Puff tends to get thick over time. Obviously every time the air and light get at it it will thicken so if a formula starts off thicker than it's almost a head start for that process. I did my very scientific drippy test and Gel ll is a bit thicker, in fact if you watch the video anyway you'll see that I actually dripped the Shellac on the rim of the bottle as I wasn't expecting it! The shine was fantastic, even from the first coat. I applied all three shades to show you what they looked like and truly test them. 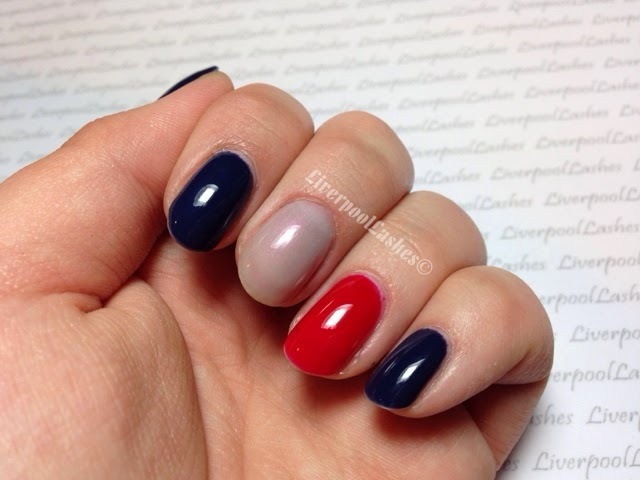 Royal Navy and My Fair Lady are exactly the colours I'd go for. Unfortunately Foggy Day I thought was going to be a cream opaque grey shade but it turned out to be a sheer grey with a opalescent finish so I'm not sure if it was designed to go over the other colours or not but hopefully you still get the idea! Royal Navy completely covers my nails and My Fair Lady is like a jelly formula so with two coats I can see the outline of my free edge. The one massive point that I noticed was the scent of Gel ll as I was using it. As I was filming at my nail desk it became apparent straight away that whilst you're painting it onto your fingers / onto your client there is a chemical odour that lingers in the air. I've tried to describe it so many times, I'm not sure if I would describe it as car oil or something along those lines. I've even asked my husband for his opinion and he thinks it smells like glue or a sealant that a builder would use. Now don't get me wrong, I actually like the smell of petrol at a petrol station and but I'm not sure that by doing a few sets of these whether you could get a headache from it, particularly if you're more sensitive to it. The scent lasted on the nails for around half an hour after the sticky layer was removed and then literally vanished. As I am currently in the middle of my nail art challenge for Cancer Research (click here to donate!) I won't be able to truly wear this gel polish for the length of time it claims to last for but I believe it's 2 to 3 weeks. The final point to be made is the price which is not yet confirmed. To run through it briefly though, Gel ll bottles are 14ml so comparing that to Shellac at 7.3ml, it's a good size (also to add in Gelish and OPI Gel Colour are 15ml each.) I suppose it depends on the overall price once it's released but if it's similar to the trade price of Shellac then that's great. However if it's more then personally when it came to deciding between OPI and Shellac originally, I decided on Shellac because I would rather pay less for the smaller bottles and have more of them than have larger bottles but less of them but we shall see how the price compares when its released. I think I've covered everything?! I wanted to make sure that I answered as many questions as I could think you may want to know so that you feel that you know the product with a truly honest perspective of it as it's new to the UK. I hope you've found it useful!